PRIMAL FEAR: samples de todos los temas de "Delivering the Black"
Debido a las diferencias irreconciliables entre el cantante Ralf Scheepers y el batería Randy Black, Primal Fear anuncian que Randy va a dejar la banda a partir del 16 agosto de 2014 - un día después de la actuación de la banda en el "Summer Breeze Festival", que sera la última de Randy con la banda. Primal Fear anunciará su nuevo batería en septiembre. Deseamos a Randy todo lo mejor en su futura carrera. Due to irreconcilable differences between singer Ralf Scheepers and drummer Randy Black, Primal Fear announce that Randy will leave the band effective August 16th, 2014 – one day after the band’s performance @ the Summer Breeze Festival, Randy’s final show with the band. Primal Fear will announce their new drummer in September. We wish Randy all the best in his future career! Notice: If you decide to comment on this subject on our board, be sure we don’t have to delete it! 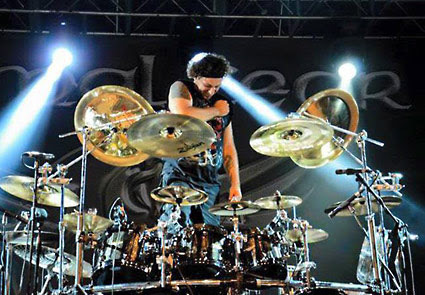 PRIMAL FEAR han reclutado al bateria brasileño Aquiles Priester (HANGAR, ANGRA) para reemplazar a Randy Black, quien dejó el grupo el mes pasado. Aquiles, hará su debut en vivo con la banda en el Knock Out Festival el 20 de Dic de 2014 en Karlsruhe, Alemania. Yes it's true - ladies & gentlemen, please give a warm welcome to the new Primal Fear drummer - Mr. Aquilles Priester! "Francesco Jovino es el nuevo batería Primal Fear. Después de 10 años en UDO, Francesco está de vuelta. 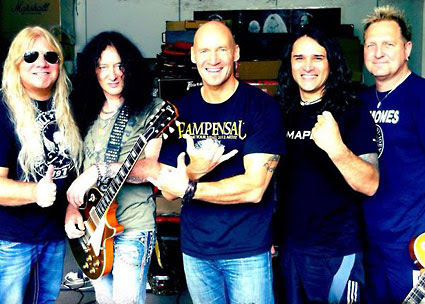 Tom Naumann miembro fundador de Primal Fear se une a la banda como un miembro oficial. Después de dos años de gira con Primal Fear, Tom es ahora de nuevo miembro de pleno derecho. Magnus Karlsson seguirá siendo miembro de la banda y co-escribir del nuevo álbum. Las grabaciones del nuevo álbum de Primal Fear comenzarán a mediados de julio en el estudio "Hansen" en Dinamarca con el productor Mat Sinner y el ingeniero Jacob Hansen. Ya están escritas 12 canciones, en preproducción. El nuevo álbum será lanzado a nivel mundial en enero 2016 a través de Frontiers. Para los fans de Primal Fear y Aquiles Priester de todo el mundo: sabíamos que iba a ser una misión difícil para nosotros, pero nos hemos dado una oportunidad y por desgracia, combinar nuestras obligaciones presentes y nuestros proyectos futuros, han hecho imposible tener una banda cohesionada. Debido a nuestros horarios y la distancia entre los continentes hemos decidido separarnos. Desde ambos lados no tenemos ninguna queja en absoluto y estamos muy contentos de haber hecho todo lo posible para que esto ocurra. Todavía somos todos buenos amigos y le deseamos todo lo mejor en el futuro. Mat, Ralf, Aquiles, Tom y Alex." 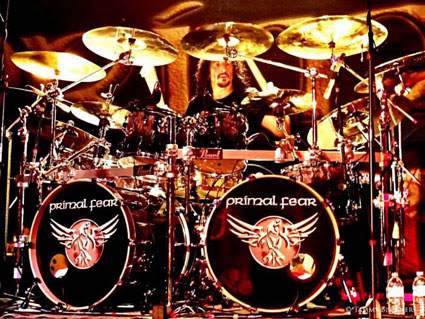 To all Primal Fear and Aquiles Priester FANS around the world! We knew it would be a hard mission for us, but we’ve given it a try and unfortunately, to combine our present obligations and our future endeavors, it has become impossible to have a cohesive band together. Due to our schedules and the distance between the continents we have decided to part ways. From both sides we do not have any regrets at all and we are very happy that we have tried our best to make it happen. We are all still good friends and we wish all the best for each other in the future. Mat, Ralf, Aquiles, Tom and Alex. A todos os fãs do Primal Fear e Aquiles Priester em todo o mundo: Sabíamos que seria uma missão difícil para nós, mas nós fizemos uma tentativa e, infelizmente, para combinar nossas obrigações atuais e futuros empreendimentos, tornou-se impossível ter uma banda coesa juntos. Devido aos nossos horários e a distância entre os continentes, optamos por nos separar. De ambos os lados não temos nenhum arrependimento em tudo e estamos muito felizes por nós termos dado o nosso melhor para fazer isso acontecer. Continuamos sendo todos ainda bons amigos e desejamos tudo de melhor para o outro no futuro. Mat, Ralf, Aquiles, Tom e Alex. Mat Sinner nos informa en su facebook oficial que Primal Fear están grabando y que la cosa esta bastante avanzada (batería, bajo, partes de guitarra, 70% de las voces), que empezarán con la mezcla en septiembre y que el lanzamiento mundial del nuevo disco de la banda será en enero de 2016. New studio update - drums, bass, basic guitars done, vocals 70% done - now more lead & harmony guitars on the agenda. Mix in September, release worldwide in January 2016 - more news soon! PRIMAL FEAR nuevo disco "Rulebreaker"
Primal Fear han elegido "Rulebreaker" como el título de su nuevo álbum, que será lanzado el 29 de enero 2016 a través de Frontiers Música Srl. El CD fue grabado en el estudio Hansen en Ribe, Dinamarca, con el productor (y el bajista de Primal Fear) Mat Sinner y el ingeniero Jacob Hansen. PRIMAL FEAR: detalles de su nuevo disco "Rulebreaker"
Frontiers Music Srl lanzará el nuevo álbum de estudio de Primal Fear titulado "Rulebreaker" el 29 de enero de 2016. El trabajo estará disponible en CD, Deluxe CD / DVD y - en colaboración con Soulfood Music en Alemania - en vinilo y en vinilo de edición súper limitada. BREAKING NEWS: Frontiers Music Srl is pleased to announce the worldwide release of the new Primal Fear studio album, "Rulebreaker" on January 29, 2016! Available in CD, deluxe CD/DVD and – in collaboration with Soulfood Music Distribution GmbH in Germany – the album is also available on vinyl and a special super-limited vinyl edition version featuring an eagle head on the vinyl. 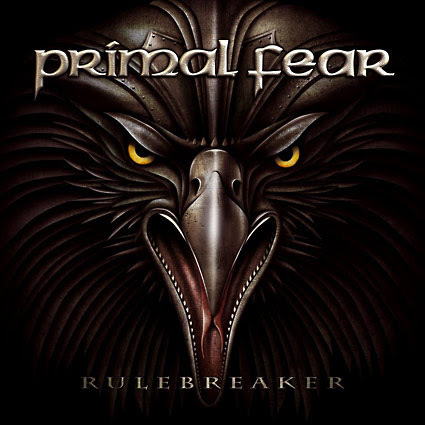 "Rulebreaker" combines the strongest PRIMAL FEAR moments ever, with a well-balanced typical PRIMAL FEAR trademark riff-vibe, crushing songs and some very ambitious musical journeys. Pre-orders for Rulebreaker will be unveiled soon. Singer Ralf Scheepers says: “We have so much energy, fantastic melodies and a hell of a drum groove on each and every song, there is no doubt that the fans will love it as much as I do! And again we have achieved to combine bombastic and atmospheric orchestral sounds with soaring heavy metal riffs and licks, together with ear splitting screams and also emotional sequences. We have kept the promise of being a heavy metal band with all the trademarks for which people love PRIMAL FEAR”. After the massive Delivering The Black World Tour, PRIMAL FEAR started the songwriting in spring 2015 and recorded at Hansen Studios in Denmark, with producer Mat Sinner and engineer Jacob Hansen (Volbeat, Pretty Maids, Amaranthe). Mat Sinner adds: “We learned a lot during the Delivering The Black sessions and the following world tour. We tried to put this know-how and all the positive energy into the songs and production of Rulebreaker. Working the second time with Jacob Hansen and even recording in his studio, gave another dimension to our sound, plus the recording comeback of founding member Tom Naumann was the right move”. Classic and ultra-fresh PRIMAL FEAR have created riff-rockers like the album opener “Angels Of Mercy,” and groove monsters “The End Is Near” and “Bullets And Tears” which hit the bulls-eye from the beginning. 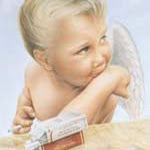 The album features another untamed speed killer “In Metal We Trust” and the metal anthem and title track “Rulebreaker”. 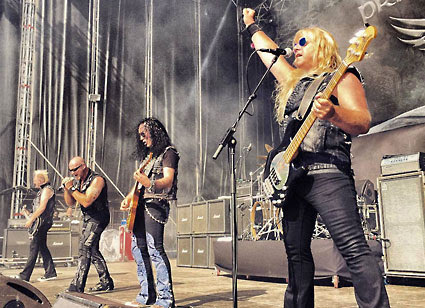 The melodic and unique ballad “The Sky Is Burning” shows a different side of PRIMAL FEAR with a new vibe and a monster chorus. And of course, PRIMAL FEAR included again an 11-minute plus Prog Metal tour de force entitled “We Walk Without Fear”, spiced with big orchestral arrangements and complex sound designs. PRIMAL FEAR are about to release what is definitely their strongest album ever: Rulebreaker! Don’t miss the German Metal Commandos on their worldwide tour in 2016! 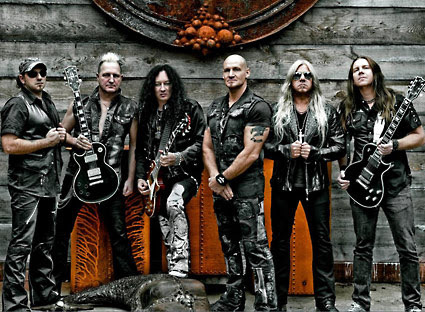 PRIMAL FEAR: nuevo tema "In Metal We Trust"